The tutorial explains the basics of Spearman correlation in a simple language and shows how to calculate the Spearman rank correlation coefficient in Excel. When doing correlation analysis in Excel, in most cases you will deal with the Pearson correlation. But because the Pearson correlation coefficient measures only a linear relationship between two variables, it does not work for all data types - your variables may be strongly associated in a non-linear way and still have the coefficient close to zero. In such circumstances, you can do the Spearman rank correlation instead of Pearson's. The Spearman correlation is the nonparametric version of the Pearson correlation coefficient that measure the degree of association between two variables based on their ranks. The Pearson Product Moment Correlation tests the linear relationship between two continuous variables. Linear means a relationship when two variables change in the same direction at a constant rate. Spearman Rank Correlation evaluates the monotonic relationship between the ranked values. In a monotonic relationship, the variables also tend to change together, but not necessarily at a constant rate. If your data exhibit a non-linear relationship or are not normally distributed. If at least one variable is ordinal. If your values can be placed in "first, second, third…" order, you are dealing with ordinal data. If there are significant outliers. Unlike the Pearson correlation, the Spearman correlation is not sensitive to outliers because it performs calculations on the ranks, so the difference between actual values does not have meaning. Are people with a higher level of education more concerned about the environment? Is the number of symptoms a patient has related to their willingness to take medication? In statistics, the Spearman correlation coefficient is represented by either rs or the Greek letter ρ ("rho"), which is why it is often called Spearman's rho. Depending on whether there are or there are no ties in the ranking (the same rank assigned to two or more observations), the Spearman correlation coefficient can be calculated with one of the following formulas. Regrettably, Excel does not have an inbuilt function for calculating the Spearman rank correlation coefficient. However, that does not mean you will have to rack your brain with the above formulas. 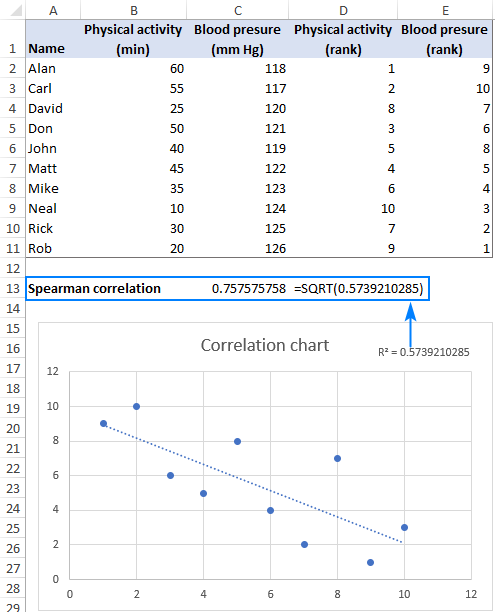 By manipulating Excel a bit, we can come up with a much simpler way to do Spearman correlation. As an example, let's try to find out if our physical activity has any relation to our blood pressure. In column B, we have the number of minutes that 10 men of the same age spend daily in a gym, and in column C, we have their systolic blood pressure. Because the Spearman correlation evaluates the associations between two variables based on their ranks, you need to rank your source data. 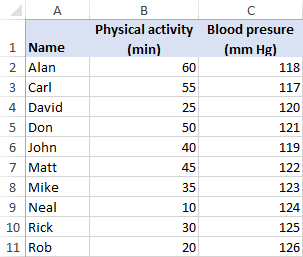 This can be quickly done by using the Excel RANK.AVG function. For the formulas to work correctly, please be sure to lock the ranges with absolute cell references. 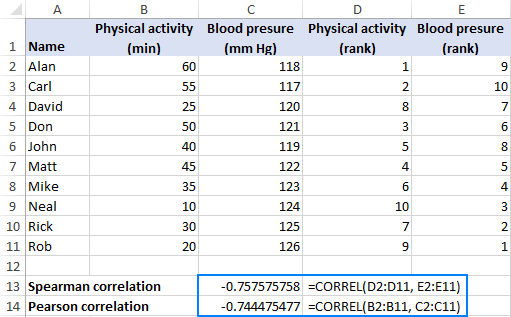 The formula returns a coefficient of -0.7576 (rounded to 4 digits), which shows a fairly strong negative correlation and allows us to conclude that the more a person exercises, the lower their blood pressure. The beauty of this method is that it is quick, easy, and works regardless of whether there are ties in the ranking or not. This formula goes to F2 and is then copied down the column. This formula goes to column G.
This formula can go to any blank cell, G12 in our case. Depending on whether your data set has any tied ranks or not, use one of these formulas to calculate the Spearman correlation coefficient. As the result, you get -0.757575758, which perfectly agrees with the Spearman correlation coefficient calculated in the previous example. Where G12 is the sum of the squared rank differences (d2). The correlation coefficients in Excel only measure linear (Pearson) or monotonic (Spearman) relationships. However, other associations are possible. So, no matter which correlation you do, it is always a good idea to represent the relationship between the variables in a graph. Calculate the ranks by using the RANK.AVG function as explained in this example. Select two columns with the ranks. Insert an XY scatter chart. For this, click the Scatter chart icon on the Inset tab, in the Chats group. Add a trendline to your chart. The fastest way is to click the Chart Elements button > Add Trendline…. Display R-squared value on the chart. Double-click the trendline to open its pane, switch to the Trendline Options tab and select the Display R-squared value on chart box. Show more digits in the R2 value for better accuracy. As the result, you will get a visual representation of the relationship between the ranks. Additionally, you will get the Coefficient of Determination (R2), the square root of which is the Pearson correlation coefficient (r). But because you have plotted the ranked data, this Pearson's r is nothing else but Spearman's rho. Note. R-squared is always a positive number, hence the deduced Spearman rank correlation coefficient will also be always positive. To add an appropriate sign, just look at the line in your correlation graph - an upward slope indicates a positive correlation (plus sign) and a downward slope indicates a negative correlation (minus sign). …and you will get the already familiar coefficient of 0.757575758. The downward slope in the graph exhibits a negative correlation, so we add the minus sign and get the correct Spearman correlation coefficient of -0.757575758. 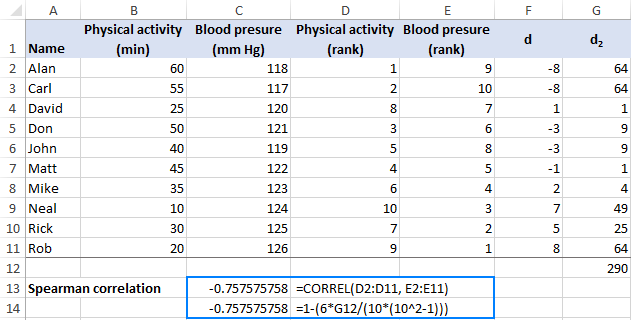 That's how you can calculate the Spearman rank correlation coefficient in Excel. To have a closer look at the examples discussed in this tutorial, you are welcome to download our sample workbook to Spearman Rank Correlation in Excel. I thank you for reading and hope to see you on our blog next week! 4 Responses to "How to do Spearman correlation in Excel"
Good catch, thank you! The erroneous screenshot is replaced with the right one.